DERBY — Carl L. Ely, 78, of Derby, beloved husband of the late Delores Jones Ely, died peacefully at Griffin Hospital on Nov. 7, 2018, surrounded by his family. Born in St. Albans, Vt. on Jan. 25, 1940, he was the son of the late Gilbert G. and Madeline Blow Ely, Sr.
Mr. Ely was a lifelong Valley resident. He was a hard worker and was employed with the Bic Pen Co. for over 30 years, until the time of his retirement in 2005. He enjoyed bowling with the Valley and Milford Bowling Leagues, participating in many tournaments at Valley Bowl and Ansmour Lanes. He loved to give presents to others, taking trips to the casino, motorcycles, music (especially Elvis), slow dancing, playing cards with his family and enjoying a good beer. He was fond of all animals, particularly his Chihuahua, Killer. 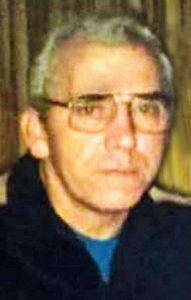 He is survived by his devoted children, Carl L. (Mary Lou) Ely Jr. of Ansonia, Jodi (Damon) Ely-Anastasion of Derby, Pamela (John) Harris of Ansonia, Natalie (Joseph) Ely-Panza of West Haven, Vernalee Annicelli of Bridgeport; his former spouse, Verna Hyman Kusterer of Derby; sister, Marie “Judy” Boylan of Ansonia; sister-in-law, Catherine Ely of Naugatuck; aunt, Florence Balisciano of Derby; eight grandchildren; two great-grandchildren; many nieces and nephews; and grand fur-babies. In addition to his wife of nine years, he was predeceased by brothers, Gilbert G. Ely Sr., Frank Ely; and sisters, Theresa Hink and Florence Michel. Funeral services will take place on Sunday, Nov. 11, 2018, at 6:30 p.m. in the Wakelee Memorial Funeral Home, 167 Wakelee Ave., Ansonia. Interment will be private. Family and friends may call at the funeral home on Sunday from 4 to 6:30 p.m.
Memorial contributions may be made to the Ansonia Animal Shelter, North Division St., Ansonia, CT 06401.